Oddball Stocks: Buying a company for less than net cash? I remember articles in the WSJ back in 2009 mentioning that some small cap companies in Japan were selling for less than cash on the books and wondering how it was possible. I also have read accounts of investors buying companies in the US during the depression for less than cash, but I never imagined that I would stumble upon one myself. I present to you Diawa Industries a Japanese maker of refrigerators and freezers. I found Daiwa by using the FT.com screener looking for negative enterprise value stocks that were profitable. Finding some of these issues isn't difficult, it's just knowing where to look, and what to look for. The refrigerators that Daiwa sells are used in grocery stores as well as restaurants. Some of the discount can be explained by the company in their December report. They state that consumers are eating out less, and that due to economic conditions their customers aren't replacing the appliances as quickly as in the past. The rest of the discount can be explained by examining their financial performance. The most important item when evaluating a net-net is the quality of the assets. In the case of Daiwa the asset makeup is very investor friendly. 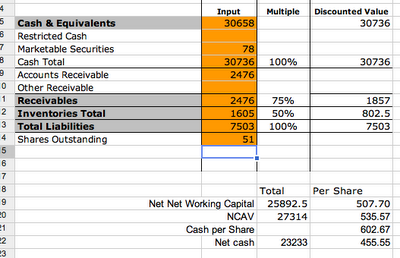 The cash minus all liabilities exceeds the market cap by a nice margin. In addition they don't carry a large amount of inventory or receivables. I have my net-net worksheet below, all figures are millions of yen except the share specific figures. In addition to a high quality asset makeup the company has been growing it's asset value while shrinking liabilities at the same time. In other words book value has been growing. One aspect that's slightly troubling is that the company keeps building up their cash hoard with no apparent way to spend it, or no desire to return it to shareholders. This is common in Japan, so not a large cause for concern. Japanese companies are notorious for ignoring shareholder interests. The stock yields 2.51% but that's not a terribly high dividend for such a cash rich company. What makes Daiwa interesting is that while it's not difficult to find companies trading below ncav that lose money, finding a net-net that's profitable is very uncommon. From Dec 2009 to Dec 2010 Daiwa earned ¥3519m or ¥68 EPS. In addition they also had FCF of ¥6477 or ¥127 per share. On an operating basis alone the company is trading at a P/E of 5.76 and a P/CF of 3.08. Both are very cheap metrics on a stand alone basis. Some of this can be explained by the fact that both cash flow per share, and net income have been declining steadily for the past five years. The company has a 58% gross margin which has remained pretty constant for the past five years. The operating and net margins tell the story of why this stock has been steadily declining. The operating margin was 21% in 2006 and has dropped to 18% as of December 2010. The net margin was 17% in 2006 and has dropped down to 12% as of the most recent statements. I don't have any sort of superior insight to know if the margin contraction will end soon, or if it will continue until they begin to lose money. Even if the margin continues to shrink I think an investor has an ample margin of safety, the company is still growing book value and is profitable. 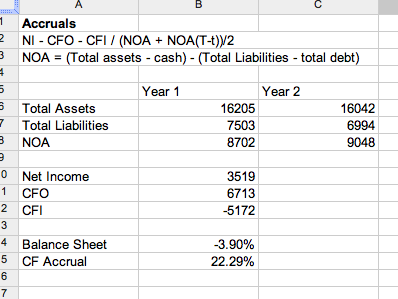 The last thing I want to highlight is the accruals worksheet I created for Daiwa, it tells an interesting story. To give some background the accruals worksheet aims to capture balance sheet and income statement accruals. An accrual is money that is set aside for a future event. So the company might sell a refrigerator and book the sale as revenue, but the payment might fall in a different reporting period, this would be accrued revenue. The second type of accrual is a balance sheet accrual, which would be something like accrued payroll expenses. Money is set aside in one period to be paid in the next. What we have in the case of Daiwa is balance sheet accruals declined over the period examined while cash flow accruals came in at 22%. This is a little high for a cash accrual which means the earnings quality isn't as high as might be desired. At times poor quality earnings can indicate fraud or potential misuses of capital. I don't see any other warning flags at this point and another metric cash paid for taxes is reassuring. The cash paid for taxes comes in at 33% which is very close to the standard corporate rate in Japan. While it seems like a no brainer to buy a profitable company for less than cash value there are always risks associated with any investments. The first risk I see with Daiwa is that their margins continue to decrease due to a structural problem in the business. A second risk is that the cash pile is squandered by management on an acquisition or venture that loses money. Japanese companies don't have a very good track record of capital allocation, and to presume they might correct it in the future is presumptuous at best. The company employs 1773 people who generate about $198k per employee in revenue per year. 1773 seems like a lot of people to generate $352m in sales. The company could be very personnel heavy which is common in Japan. They could continue the trend of growing the payroll at the expense of shareholder value. The stock has an average volume of 56k shares traded daily. The stock can only be bought in blocks of 1000 shares, so around 56 transactions take place each day. To build a $100k position it would take two trading days at 25% of the average daily volume. It is nearly impossible for a shareholder to agitate management to change and become more shareholder friendly. Investing in Daiwa means hoping that eventually the market will recognize the valuation imbalance and will correct it. The stock has lost money four out of the last five years with most losses deep in the double digits. A shareholder needs to gird themselves for potentially more losses before intrinsic value is realized. I think Daiwa Industries presents a compelling opportunity. On an asset basis alone the stock looks like a very good buy, but the assets aren't the only thing an investor is buying. Because of the low probability of asset conversion it's important to evaluate the operating business as well. While the operations haven't been growing they are still solidly profitable and reinforcing the margin of safety. I think stocks like Daiwa are very rare finds. Talk to Nate about Daiwa Industries or investing. Disclosure: As of this post I do not own Daiwa Industries, although I am considering initiating a position in the next few days. I haven't done anything yet about my yen exposure, but it's something on the radar for sure. I'm letting it ride for now, but I'm considering a hedging technique. There are a number of currency ETFs available that are very liquid and could provide a good hedge. FXY is optionable, so a cheap way is to buy some long term puts, what's interesting is the open interest on the Jan 13 90s is enormous, so you wouldn't be alone in betting on a yen decline. The problem with hedging like I mention above is it really only takes care of the edge case of when the currency declines. What you actually want to do is lock in the value of you position currently and ignore the currency. You can actually do this by building an option spread on the currency ETF around the current value. So if the yen rises one sides loses other gains, and vice versa. Of course this is also more costly than a simple hedge as well. I use Fidelity which charges me 3000 yen (about $30) to place a trade of any size. I know some investors use Interactive Brokers which is even cheaper a smaller trade of a few hundred shares might only be $5. E*Trade also allows Japanese trading, it looks like they charge 3399 yen so about $40. An alternative I haven't mentioned in any post yet is that some of these companies trade on the US pink sheets as a foreign ordinary share. So Daiwa Industries trades as DAWIF, but be careful they might not trade for months, and on very low volume. I haven't ever traded this way, but it's a possibility. This happens in the US markets as well (firms trading below net cash value), although rarely any firms larger than $50 million or so and VERY rarely profitable firms. There are something like 20-30 firms trading below net cash value in the U.S. market right now, but most are in liquidation, are not profitable, or are restricted in how they can use their cash. Thanks for the help Nate! Or for a nicer formatting you can go to http://investing.money.msn.com/investments/stock-cash-flow/?symbol=US%3aDAWIF and expand the relevant section. I am wondering if that might represent the Leasing operations of the business. Otherwise I am at a loss but that's something which would be good to understand. Shame we can't read Japanese!! !